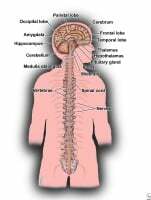 What Facts Should I Know about the Central Nervous System (CNS)? How Does Demyelination Cause Diseases Like MS? How Is the Myelin Sheath Destroyed (Demyelination)? The central nervous system or CNS is the part of the nervous system made up of the brain and spinal cord. The brain is divided into two halves: the right hemisphere and the left hemisphere. These hemispheres lie on a central structure called the thalamus, which relays information between the peripheral input from the senses and the brain. Other central structures include the hypothalamus, which regulates automatic functions such as appetite and thirst, and the pituitary gland, which is partially responsible for growth, metabolism, and stress response. Myelin is a fatty material that coats, protects, and insulates nerves, enabling them to quickly conduct impulses between the brain and different parts of the body. Myelin also contains proteins that can be targeted by the immune system. Myelin coats the nerves of both the central nervous system and the peripheral nervous system; the destruction of the myelin in the central nervous system is what triggers many of the symptoms of multiple sclerosis (MS). Nerve cells are coated with sections of myelin, and the tiny spaces between the sections are called nodes. As the brain sends messages through the nerves of the spinal cord, the impulses jump from node to node. The myelin sheath prevents these impulses from escaping from the nerve at the wrong point. In multiple sclerosis (MS), the body's immune system T cells attack the myelin sheath that protects the nerve fibers. The T cells either partially or completely strip the myelin off the fibers, leaving the nerves unprotected and uninsulated. The nerves are not as able to pass messages from the brain to the other body parts. The messages the nerves try to send are delayed or distorted and the messages the brain receives may be misinterpreted. Myelin is lost in multiple areas, leaving scar tissue that due to its hardened characteristics is called sclerosis. These damaged areas where the sheath has been destroyed and further disrupt the ability for the nerves to pass messages are also called plaques. These plaques can be identified by magnetic resonance imaging (MRI), a technique that helps doctors assess and monitor the progression of multiple sclerosis. 1. Adams R, Victor M, Ropper A. Multiple Sclerosis and Allied Demyelinative Diseases. In: Principles of Neurology. 6th ed. NY: McGraw-Hill; 1997:902-927. 2. Dangond F. Multiple Sclerosis: A Prototypical Human Demyelinating Disease. In: Dangond F. Disorders of Myelin in the Central and Peripheral Nervous Systems. Butterworth-Heinemann: 2002:103-138. 3. Dangond F. Repair and Neuroprotective Strategies in MS. In: Olek MJ. Multiple Sclerosis. Etiology, Diagnosis, and New Treatment Strategies. Totowa, NJ: Humana Press; 2004:193-207.